The weather here was fairly warm in January. Those 70 degree days and 50 degree nights would seem wonderful on the surface. But as a fruit grower, I know that many of my fruit tree varieties require a certain number of “winter chill hours,” or hours below 45 degrees F.
The weather has been so warm that my four apple trees never lost their leaves last fall. They are not getting enough winter chilling to set fruit this spring. 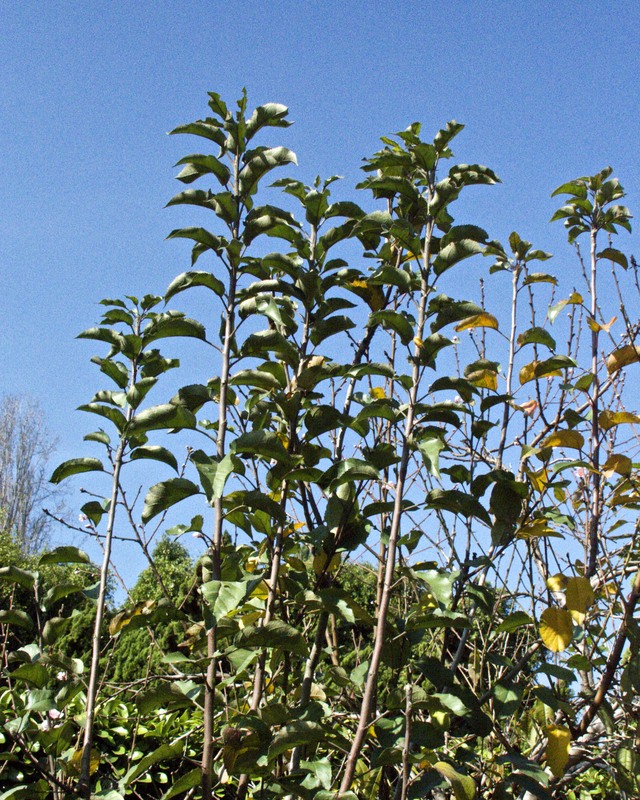 When choosing fruit trees, I picked varieties that were adapted to low chill. I’m pretty sure that my citrus trees don’t require any chill hours. But my apples, pears, and stone fruits require 200-300 hours of cold. They’re not getting it this year. Our Florida Prince peach is the first to bloom. The crazy warm weather sent this tree into bloom in early January, a bit early even for this variety. Now in February it is in full bloom. But has it had enough chilling to set fruit? Here is a comparison of the cumulative amount of chilling hours in Orange County California to date each year over a six-year period. We have received only 76 hours of chilling this 2014/2015 season so far. That is the warmest year-to-date over this six-year period, which was in turn warmer in general than average. This is global warming in action. What this means is that I’m not likely to get many (if any) apples, Asian pears, peaches, plums, apricots, or nectarines this summer. Consequently, I am going to have to readjust my harvest goals, since fruits often comprise a third or even half of my harvests. The Asian pears are dormant this time of year. They need chilling for proper fruit set, but they’re not getting it this year. Well, that is the looking ahead part. For now, things are fine harvest-wise. In the past week, I harvested nearly three pounds of limes, plus bell peppers, green onions, and arugula. Keep in mind that my garden is small, with three raised beds of 3 ft x 6 ft, one raised bed of 3 ft x 12 ft, a bed of 3 ft x 3 ft, and a few patches and pots here and there where I grow green onions, strawberries, artichokes and such. Here are the totals. I finally added up my harvest totals for 2013, and they were low, like 2014 (see sidebar for 2014 totals–Total fruit for 2013 was 92 lbs; total vegetables was 74 lbs). Then it dawned on me that I gave up my community garden plot in 2012. No wonder my vegetable harvest is down in comparison. I need to adjust my expectations accordingly. Between reduced garden space and global warming preventing my fruit trees from getting their required winter chill hours, I can’t expect a big harvest in 2015. All I can do is re-dedicate myself to utilizing the space that I do have (about 100 square feet of vegetable garden space) and making the most of it. Egg production in another issue. One of my hens laid eggs sporadically all winter long, which is unusual. Still, we had to buy four dozen eggs to get us through the winter. Chickens tend to stop laying in winter due to short day length. The good news is that the days are getting longer now, and one of the other girls has started her spring laying. Now I have two active layers. I also have three lay-abouts who are not producing. I expected them to have started laying by now since egg production here in coastal southern California picks up in mid-January. Well, they’re getting older, just like me. My oldest hen is now seven years old, and the next oldest is six. Their best years are behind them. If I were a real farmer, they would have gone into the stewpot by now and I would have replaced them with younger birds. A chicken’s best laying years are the first and second years, when she will produce about 250 eggs per year. My two youngest birds just turned three, and the others are five, six, and seven. I am hoping that my flock of older hens will still produce enough eggs for my husband and me. If they were all young hens, they would produce a whopping 1250 eggs, WAY too many for us to use. I am going to set my egg production goal at 400 eggs this year, which seems reasonable given the ages of my five hens. I will set my fruit production goal at 80 lbs, and my vegetable goal also at 80 lbs. Looking to a warmer future, I have recently planted a pomegranate tree and another Fuyu persimmon tree. As far as I know, they don’t require chilling. But they will be too young to produce for several years. I have added netting to one bed to prevent the birds from eating my lettuce and peas. And I dug up another bed and got it planted today with chard and bok choy. Every growing season brings new hope to a gardener. This entry was posted in Uncategorized and tagged apples, apricots, Asian pears, backyard chickens, California, climate change, Fruit, global warming, Harvest Monday, harvest totals, nectarines, peaches, plums, setting harvest goals, southern California, urban chickens, vegetable garden, winter chill hours. Bookmark the permalink. I am amazed at the amount of harvest you get from such a small space. Thanks for the lessons on fruit trees and laying hens. 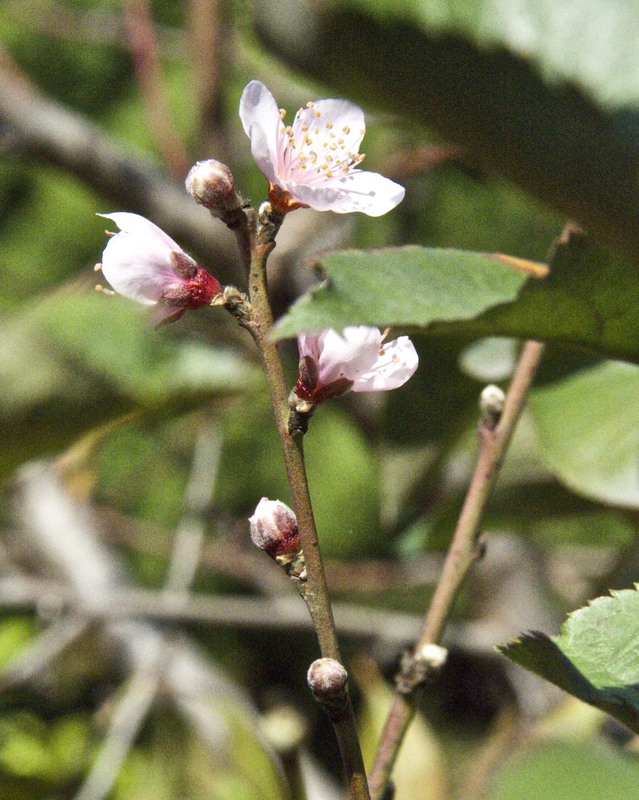 Hopefully your peach tree will set fruit. Norma, we are always learning, aren’t we? And hopefully, we inspire each other. I want to sprout mung beans after reading your post yesterday. There is a great blog I have been following. It might help you with your apple problem. I don’t know if it works, but he is trying to grow apples in Florida, and runs up against chilling problems. What he found in his research is that you can physically strip the tree of its leaves and it will mimic dormancy. Then (supposedly) you’ll get fruit. Here’s the link, with a video attachment. I hope it helps you. Crafty Cristy, what a helpful suggestion. THANKS! 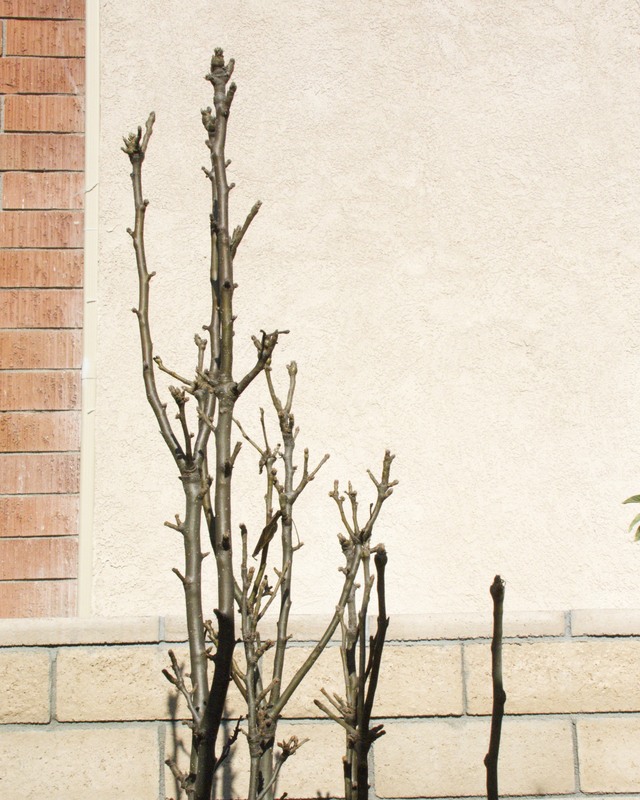 We had the exact opposite problem last year – extreme low winter temps in Jan & Feb caused my fruit trees to loose all their fruiting spurs (or so I think) resulting in zero fruit last year. I’m crossing my fingers that we don’t have a repeat of that this year. Good luck with your trees – hopefully they give you at least some fruit this year. Margaret, you have my sympathy. The weather has become quite fickle and unpredictable. Too hot, too cold, too much rain, not enough. We just keep trying. I like counting my fruit and vegetable harvest separately. I never have goals for my fruits as they are so fickle. Some years you get tons. And some years you get none. They are more reliant on mother nature than they are on me. The vegetable garden is the other way around.